The equine genome has been sequenced, and geneticists are starting to get a handle on how gene research might soon yield scientific reasons why one horse is faster than another. That's the basis of the inaugural Thoroughbred Pedigree and Genetics Symposium held Oct. 11 in Lexington. The seminar, presented by The Blood-Horse and Pedigree Consultants, was a one-day event with several prominent speakers. For a recap of the day, read Genetic Research New Tool in Breeding. It's about time that the Thoroughbred industry enters the scientific age. It's scandalous that leaders in our industry have avoided the topic of genetic research for so long. (And even today the pushback continues.) It's inexcusable we've lost decades in opportunity to better understand how the Thoroughbred athlete works. I was pleased to see an overflow crowd at the event. Attending were everyone from the names you see in headlines every week down to the owners of two or three mares; veterinarians and research administrators; pedigree advisors; bloodstock consultants; trainers; and pundits and peers. One important take-away message that I want to share is this: there is nothing coming that will eliminate the need for careful pedigree and conformation evaluation when selecting racing or breeding stock. In fact, the opposite might well be true. If some of the existing research pans out and we identify specific "speed genes" or other markers that signify speed (and soundness and stamina, etc. 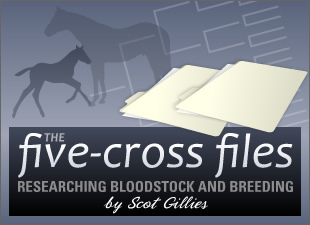 ), you can bet that before long all Thoroughbreds will be bred to embody those genetic attributes. So will we then have an entire breed of Secretariats? No, not quite. We'll instead have a more homogenous breed with near-identical talents--but there will always be standouts that rise above their fellow runners. It will still be the responsibility of the breeder to identify mares with ideal conformation and to send them to the most fitting stallions, with bloodlines/aptitude/class to match. It will be an even greater asset in coming years for those purchasers of racing stock who are able to differentiate minute differences of potential from a more kindred pool. The Thoroughbred researcher of the future--the individual with an understanding of the genetic underpinnings of the breed, combined with a nuanced knowledge of pedigree patterns and conformational evaluation--will continue to have a distinct advantage over his fellow horsemen. Pedigree study and conformation evaluation have always been an art. Genetic science should shape, not eliminate, the use of our art in the future.